North Carolina had a lot of snow last week, and some shed owners found out why the carport that they purchased had such a low price tag. That bottom line is – cheap doesn’t hold up under pressure. 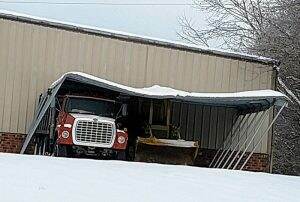 Sheds shouldn’t collapse under the weight of a foot of snow. If they do, they’re probably installed incorrectly, have steel that is too thin, or weren’t braced. At Hometown, you don’t have to worry about any of those things. Our crews are experienced and are held to the highest quality standard. Our standard carports are braced are braced on each corners and on on the peak of each truss. If you’re really worried about a snowstorm, you can get your carport certified with a snow load rating of 35 psf – that’s 35 pounds of snow per square foot! One foot of snow is no problem for Hometown Garage! At Hometown Sheds we are proud to offer only the best products on the market. Don’t get snowed under. Purchase your carport from Hometown Sheds and enjoy no matter the weather!